People own far more mobile devices these days. Everybody and their mother has a smartphone, and that’s before you start thinking about tablets, laptops, speakers, earbuds, and similar small gadgets. Most of which are totally dependent on some kind of battery. But every battery win run dry eventually, and you’ve probably noticed that wall outlets aren’t always available. Which is why a lot of people are starting to haul around portable power banks with them. It’s a pretty sensible solution. Need a bigger battery? You can literally buy one and carry it around with you. That’s not quite as elegant as having a larger battery inside of your devices, but it comes pretty close. At least, if you end up picking the right charger. Different sized chargers tend to be made for people with different needs. Needs tend to be especially varied when looking at portability issues, and of course battery capacity. Some chargers are huge; some chargers are small. Many chargers are somewhere in-between. Picking the right unit depends entirely on the kind of usage you anticipate. True to its name, the Solice 20000mAh Portable Charger is constructed around a fairly large 20000mAh battery. That’s actually more like a medium-sized charger compared to many of the bricks you can find on the market. But when you’re picking a battery like this, you really want to pick the largest battery that you can live with. Even if you look at giant 27,000mAh batteries and think to yourself, “there’s no way I want to carry around that giant thing”, you still want to go as big as to can bear. Because bigger batteries will almost invariably be able to deliver better performance, or at least a higher capacity. With that said, the Solice Portable Charger is a middle point between extremes. Not everyone likes it in the middle, but for those who do, there are plenty of things to like about this charger. And as with any portable charger, there are a handful of things that are unlikeable as well. 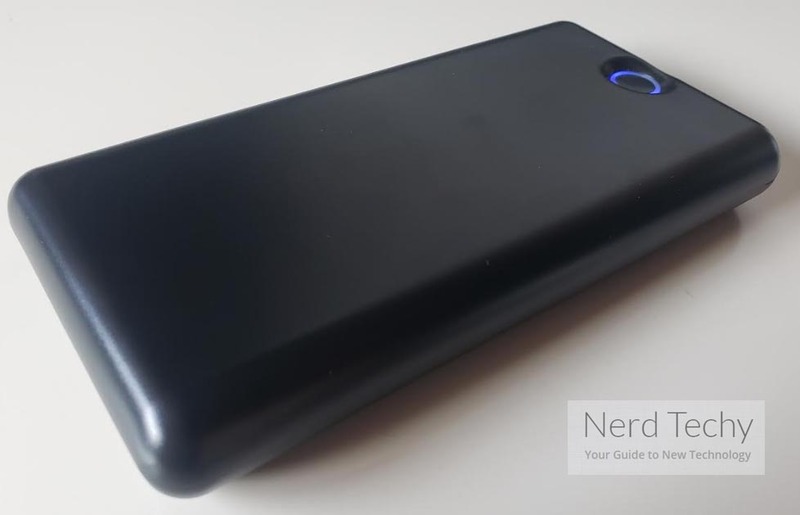 The Solice 20000mAh Portable Charger measures 6.6 x 3.4 x 0.87 inches, and weighs just over a pound. Fairly compact and portable, somewhat comparable to a smaller smartphone. It’s particularly nice that the weight doesn’t get far past one pound. Even though that makes it slightly heavier than a smartphone, it’s easy for small chargers like this to weigh much more with some types of design. Some people prefer chargers with a metal chassis. That’s understandable. After all, portable chargers like this are basically small firebombs. One puncture wound into the chassis could be ugly. 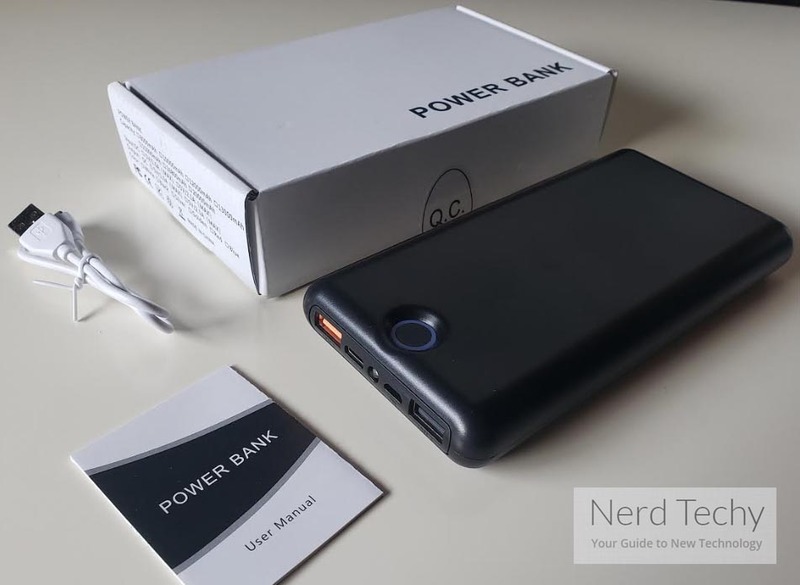 But like many similar devices, the Solice 20000mAh Portable Charger was primarily constructed with a thick layer of ABS plastic, which was very lightly rubberized. If you’re willing to nearly double your budget, aluminum chargers usually look much better, even though they don’t really offer that much more protection from day-to-day hazards. Putting aside looks, portable chargers are virtually disposable devices, so it’s not typically a good idea to heavily invest in them. Which is precisely what draws so many people to less expensive chargers like the Solice Portable Charger. 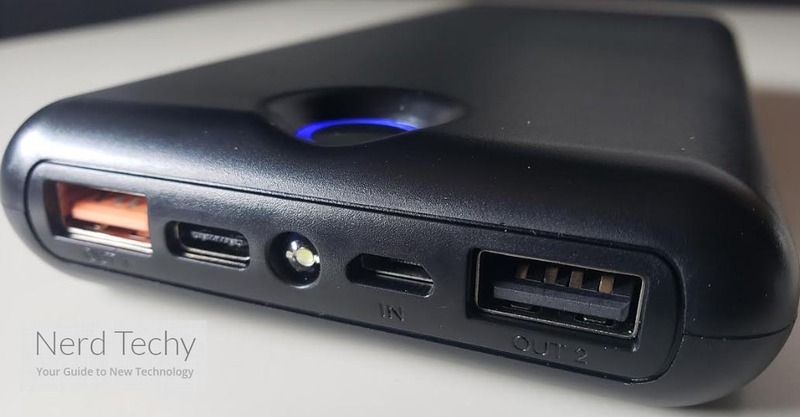 Putting aside construction materials, the front interface was constructed with a pair of USB ports that allow the power bank to charge two devices at the same time. Those ports are pretty high-powered and fairly impressive, but we’ll cover those in more detail a bit later on. Although many portable chargers tend to be nothing more than a power brick, some of the nicer chargers on the market tend to have a little bit more to offer than an I/O. The front side also has a large battery indicator LED and a power indicator. More specifically, a circular blue light in the corner of the device is lit up in quarters, giving you an indication about the remaining status of your charge. Though this is really only an approximation rather than a precise time estimate, it allows to you to keep your guess within 15% accuracy or so. In addition to the USB ports, the front side of the device hides away a large LED light, which can be used in a number of different ways. Because the light was smartly designed. For instance, because it’s an LED, it isn’t going to burn through much battery life. It’s also built with an auto-off feature that ensures you can’t accidentally drain the battery of your charger by forgetting about the light. And since you’re using an LED, you don’t have to worry about the bulb burning out anytime during the entire lifespan of the device. Speaking of lifespan, how long can you anticipate this charger to last? Well, that’s actually a tricky question because batteries are basically like consumables. When you take care of a battery but still use it heavily, then you can typically expect a device like this to last about three years. When you take care of it and use it casually, then you might anticipate as many as five years of use. But that’s really just a timeline until the device will absolutely need to be replaced. For someone who’s frantically using their charger, it can actually be helpful to replace it closer to the 2-year mark. Because even after a single year of regular use, the maximum capacity of this charger will slip down towards 18,000mAh. Which isn’t a night or day difference, but that sort of gradual decay only continues to accumulate with time, until your battery capacity is no longer very impressive. 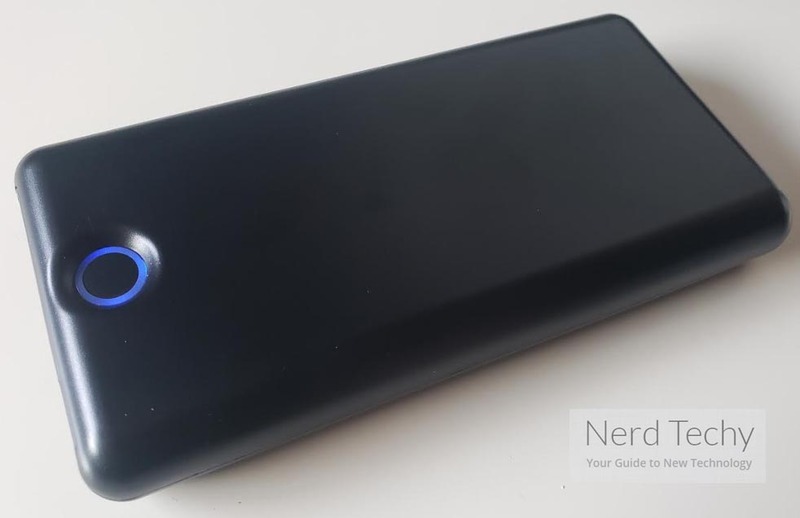 The Solice 20000mAh Portable Charger was designed to work with essentially any popular USB powered device out there, from tablets and smartphones to Bluetooth speakers or headphones. That includes iPhones, Galaxy tablets, Google phones, and so on. If you have a mobile device that can recharge through USB, then it’s pretty unlikely you’re going to find compatibility issues, period. 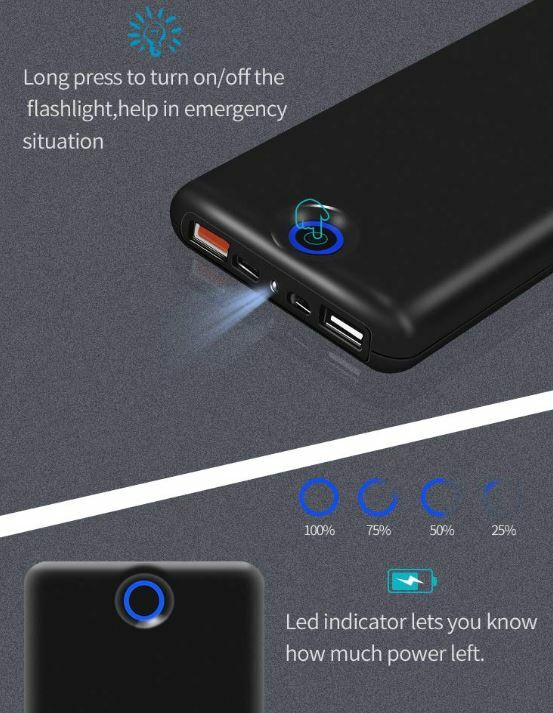 More than just recharge your stuff, the Solice 20000mAh Portable Charger was constructed with the kind of common sense safety and convenience features that people don’t generally think about. It might be okay to take for granted that this charger isn’t going to burn down your house, but it’s not good to take for granted that it’s capable of treating your electronic equipment appropriately. Portable chargers aren’t necessarily universal devices, like the Solice Portable Charger. But in this particular case, this charger was also built to automatically determine the type of device that’s attached through USB, and then use the electric current most appropriate for the device. In other words, it should work similar to your original power adapters. So you don’t have to worry about this charger accidentally doing a number on the batteries in your mobile devices. Perhaps more pertinently, the inclusion of QC 3.0 means the charger will automatically adjust voltage to ensure you get the quickest possible charging time. These USB ports have a 5V 3A output, though they can be split to 12V 1.5A or 9V 2A as needed. If you’ve got a device that can only accept 1.5A input, then this charger can adapt to those requirements. And if you’ve got a device that can handle a larger 3A throughput, then this device will figure that out and start putting out some extra juice. Pretty handy, especially because you don’t actually have to get involved in managing it. So how fast does your stuff recharge? It partially depends on your stuff; it even depends on the cables you use to connect to this device. But whatever the case may be, this portable charger won’t be the component that gets in the way of your speed. 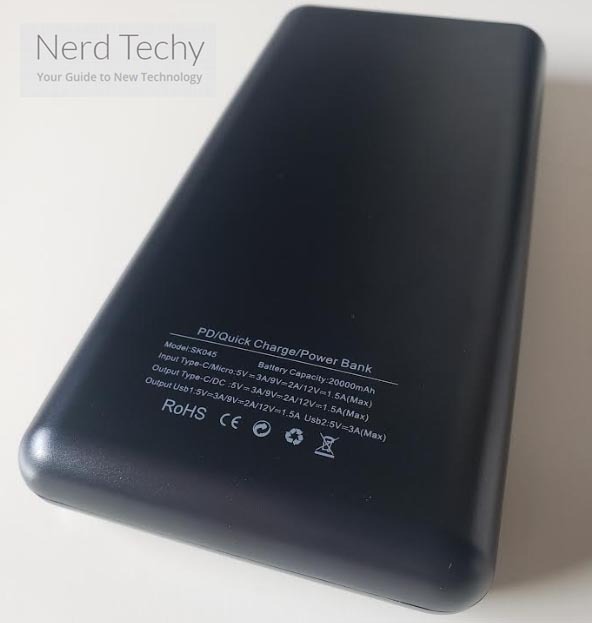 As should be quite clear by its name, this device carries a 20000mAh battery. That’s capable of producing about seven recharges for an iPhone 7, or five recharges for a Galaxy S8. Unfortunately, this charger doesn’t perform quite as well when it comes to tablets. Simply because tablets have enormous batteries that dwarf those inside of smartphones. Nevertheless, with an iPad mini, you can get about two full charges, and with full sized tablets you can do about the same. However, if you intended to refill super-large devices like a tablet on a regular basis, you would want to consider using a slightly larger charger. Though you’d end up with a physically larger device, too. Speaking of room for growth, the largest batteries you can take on commercial air travel are about one quarter larger than this battery. If air travel is a primary concern of yours, then you should know you can go a little bit bigger, if you really need it. For instance, another charger I reviewed recently, the DBPower Q100, pushes right up against the limits of what you can carry on a flight. But again, it’s drastically larger than the Solice Portable Charger. In addition to the portable charger, Solice includes a micro USB cable, user manual, and a one-year warranty. The user manual can actually be useful for someone who could use a brief reminder of how to take care of batteries like this. When you take care of your battery, you can expect it to last much longer. One more thing to note. It is possible to use this battery while it’s being charged, but obviously that will slow down its recharging speed, so doing so is still inadvisable. 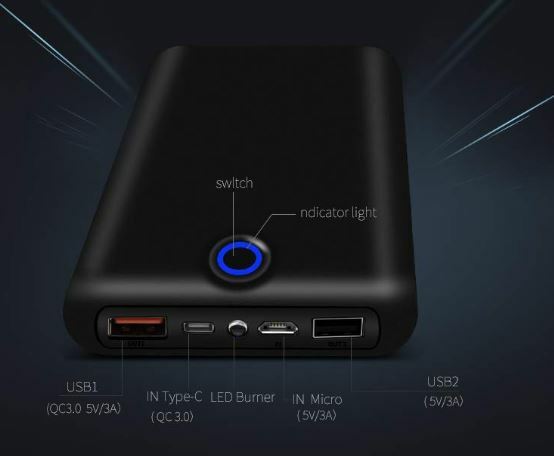 Who Should Choose the Solice 20000mah Portable Charger? The Solice 20000mAh Portable Charger could be put to a lot of different uses. You might connect it up with a Nintendo Switch, and keep the battery charged for two or three days of regular play. You might use it for traveling around the world, for powering up a heated jacket while camping, or even for taking with you on a regular daily routine. Because it’s portable, you have an especially wide range of options. This isn’t the right charger for powering up a laptop, or really even for powering tablets on a regular basis. But for someone who wants a little more juice for their earbuds, smartphone, portable Bluetooth speakers, or similar devices, the Solice charger is bound to be more than enough. Especially for people who really value portability.